Harvey Stromme, born in Viceroy, Saskatchewan in 1924, had a very difficult home life and endured the terrible dust storms and devastation of the ‘dirty thirties’. God had a plan for his life that he was not aware of until one day he heard the gospel on the street corner as a Salvation Army group sang “What a Friend We Have in Jesus” and the granddaughter of the local barber sang “Jesus Loves Me” in her grandfather’s shop. He went to church the next day and heard about that “Friend in Jesus and His love”. That night he knelt by his bed and asked Jesus to be his Friend and Savior. He had a deep hunger for the Word of God voraciously memorizing Scripture and eventually graduating from several Bible Colleges. Harvey pastored several churches until he answered God’s call to the mission field through SIM arriving in Nigeria in October 1966. What was to be a short-term became a life-long ministry most of it in Gusau in the northwest area of Nigeria. One by one God brought needy children to Harvey’s doorstep whom he took into his own home to feed, clothe and educate. In no time he had a ‘family’ to care for as well as pastoring a church and teaching 35-40 Christian Religious Knowledge classes each week in the schools and colleges. More than 100 children in Nigeria have called Harvey’s house ‘home’ and he has over 500 grandchildren. Harvey’s only passion has been to share the love of Jesus and His saving grace with everyone whether in Canada or Nigeria for the glory of God. Note from Norma: It has been my privilege to have known Rev. Harvey Stromme for over 25 years and to have had a part in publishing his amazing story. All proceeds from the sale of this book go to supporting the ongoing work in Nigeria. Hi I grew up in gusau and knew Rev. Strome well. My parents are in Canada in Ottawa at the moment they would love to get in touch with him again. Can I get a contact from you? Hi Aruni. I have forwarded your contact information to the book’s author. I hope you will hear from Harvey soon. They have been in touch. Thank you! I was born 1969 in the church he was the pastor in Gusau. I would like to know if he is still alive. My father Joshua Hindan was the choir master at that time. Pastor Strommie taught my father to play the accordion. I was dedicated in the church by him. I would very much want to reach him if he is still alive. Hi Phoebe. Yes, Harvey is still alive and doing well! I have forwarded your email to Irene Ward, the book’s author. I hope Harvey will be in touch with you soon. Thanks Norma. His labor has not been in vain. He first got my father Joshua, then his family. All 9 children love the Lord and are saved. And now is from generation to generation serving the Lord. Praise the Lord. I was in class 4 in SIM Primary School Gusau around 1970 or 1971 when Rev Harvey Stromme arrived Gusau for the first time. The Headmaster of the school at the time was Mr Taliya Gajere. In my class then was Dr Dauda Dangiwa who is now a lecturer in the Faculty of Pharmaceutical Sciences at the University of Jos, Nigeria. A large number of us from the primary school were taken to Gusau aerodrome to welcome Rev Stromme. I dont remember how those that went for the welcome reception were selected. Probably classes 4 to 7 because it was a long walk to the aerodrome for children of our ages then. I remember him as a fine gentleman I left Gusau and SIM Primary School around 1972 when my parents moved to Zaria. I went back to Gusau in 2015 (about 43 years after) and tried to trace Rev Stromme after Dauda had repeatedly told me that he was still in Gusau. I got to the church which is now ECWA following the renaming of SIM decades ago. The security guard at the church told me that Rev Stromme had returned to Canada around 2008 or 2009. I was overwhelmed by nostalgia. 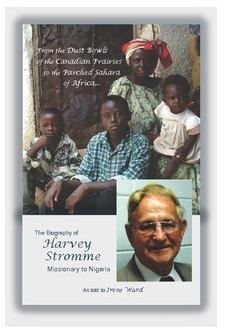 God bless Rev Harvey Stromme for the tremendous work he did in Nigeria and in Gusau particularly. I wish I had the opportunity to meet him again before he finally left Nigeria. May God reward him for his labour of love and for the work he did to advance the cause of the gospel in an area that became characteristically Sharia even while he was still there. My warmest regards to him even as we ceaselessly pray that God will keep him in good health. I am delighted and proud to be one of his early Gusau children. I will surely get the book “The Biography of Harvey Stromme”. January 2019, Just to say Reverend Harvey Stromme is indeed alive and well and my husband and I had the joy of chatting with him at our church service here in Ontario, Canada this morning! He taught my husband’s father and many others here over the years. Praise God for faithful ministers such as Harvey! May the Lord give him many more years to minister the blessed gospel message of salvation in Jesus!